Like anyone who has been alive over the past ten years, I own several smartphones. I recently upgraded my phone to an Apple iPhone 6s Plus. I checked the going rates for the Apple iPhone 5s at was disappointed at the prices being offered so didn’t bother to sell it. While investigating cloud services, I stumbled upon a few ways to turn a smartphone into a home security camera. There are two things to work on if turning your smartphone into a home security camera. First, there’s the software part. There are several good apps and services that will turn your smartphone into a home security camera. I recently gave a cloud service called Camio a try. Initially, my interest was more of the service’s ability to work with a Nest Cam that I have. While setting that up, I was surprised to learn that Camio also allows you to turn a smartphone into a home security camera. Supported features include cloud storage, motion detection and the ability to train it for false alerts. The service will even send emails when an event is detected. Many of the features are available at no charge except the cloud storage which has a monthly subscription fee. Camio works on iOS and Android phones. Another good application is Salient Eye. This application is very easy to setup and will turn your smartphone into a home security camera in almost no time. Salient Eye takes a rather novel approach at sharing videos with the user. It does not allow viewing of live images but it does message and email alerts along with a photo of the event. Salient Eye only works on Android, not on iOS. The last application to discuss is called Surveillance App. The app does what the name says, it turns your phone into a surveillance device. Unlike Salient Eye, this app supports live views of the action. The app even supports audio. Full functionality requires a monthly subscription fee of 99 cents and that’s not a bad price. This app only works on iOs, not on Android. The second thing needed to turn a smartphone into a home security camera is some hardware. You need a good mount. The requirements of the mount aren’t a lot different from one that’s used in a car, but the placement will be different. Most mounts used for turning a smartphone into a home security camera are likely to sit on a table or perhaps even a suction cup to stick it to a smooth flat surface. Let’s look at a few good mounts. You are going to need these. Standing a smartphone against a wall is likely to result in a video that’s slanted upwards. 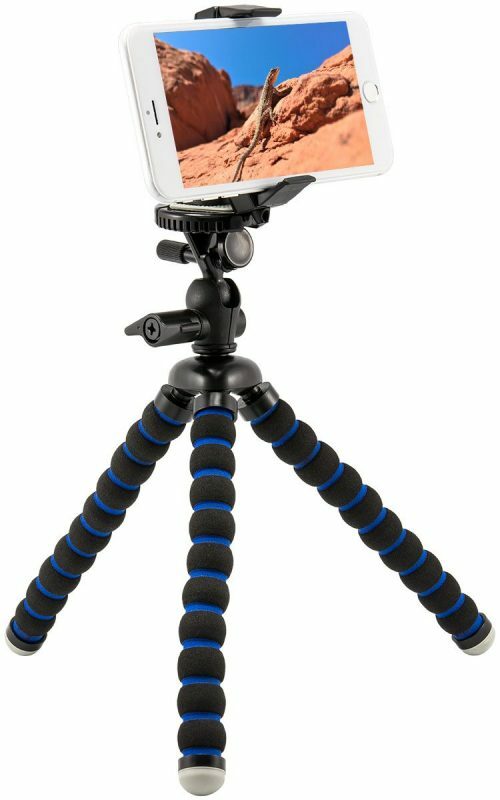 A small tripod such as the Arkon Universal Smartphone Tripod Mount is an excellent choice to hold your phone. That’s the mount that is pictured with this article. It’s one that I have used personally and it holds up very well. I like the bendable legs that can be used to wrap it around something or simply use it as a mini tripod for placement on a table or shelf. This tripod mount allows placement of the smartphone nice and high and permits angling it downwards or turning into landscape. The holder opens to 3.6 inches to hold almost any phone. The Arkon Mobile Grip 2 Sticky Suction Cup SmartPhone Mount is the one I would use for attaching to vertical surface such as a window. This is another mount that I have used. The bottom of the mount provides an extreme hold on a smooth surface. It has a vacuum lock to help get the best grip. The holder part opens to 3.6 inches and that’s large enough to hold almost any phone with or without a case or skin. The mount permits swivel into portrait or landscape mode. Looking at a good home security camera will set you back a lot more money that a decent mount and app. If your monitoring requirements aren’t too extreme, using a smartphone as a home security camera might be a good idea.